This latest church rampage was initiated by Muslims killing each other over an affair between a Christian man and a Muslim woman—and then transferring their violence onto the Copts of the region and their church. Not once did Hassan condemn the Muslim perpetrators. He even referred to the Copts as "dhimmis" and "pact-holders," prompting outrage among Egypt's indigenous Christian population, or as one Copt put it: "Hassan wants to make Dhimmis out of us… I thought we were living in [a] country with a constitution and a police force and not in Mecca or Medina, 14 centuries ago. Or maybe this is a first step to later subject Christians to Jizya for protection." As medieval as this entire anecdote is—and as anachronistic as Hassan's rationale of "sorcery" is—none of this is surprising. What is disappointing, however, is that the Egyptian army—recently touted as the noble "savior" of the Egyptian people—and the Arabic media—which provided 24-hour coverage of the Tahrir Square protests—have both blatantly demonstrated their bias against Egypt's Christians. Portrayed in the Western media as magnanimous for restraining itself against Egypt's civilians during the recent uprisings, not only did the Egyptian army allow the wanton destruction of the church to go unfettered, but it also opened fire on Christians protesting the burning of the church, killing nine and seriously wounding at least a hundred, some beaten with electric batons. Coptic activist lawyer Sherif Ramzy, who was among those assaulted, said that the soldiers also cried "Allahu Akbar" before attacking the Copts, adding, "This only shows that the army is infiltrated by Islamists." Nor was this the first time since Mubarak was ousted that the military attacked Copts: in late February, armed forces, including tanks, opened fire on a 5th century monastery (as churches are accused of "sorcery," monasteries are accused of stockpiling weapons). Likewise, as Muslims spent some twenty hours pulverizing the church at Sool with sledge hammers, neither the military, nor state security ever appeared—and this near Cairo, Egypt's capital, not some inaccessible village. 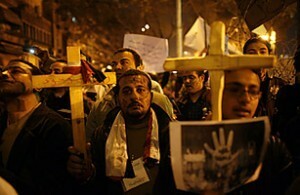 Aside from what all this bodes for the Copts, Western observers should also be concerned. 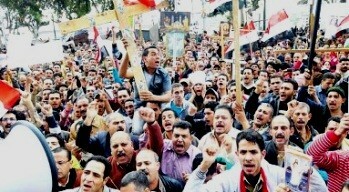 For starters, that the Western media closely followed Al Jazeera's lead during the Tahrir Square protests, while being virtually clueless of these massive Christian uprisings, suggests that, when it comes to information on the Middle East, the Western mainstream media is heavily dependent on the Arab media, especially Al Jazeera. This is not to say that the West agrees with the point of view put forth by Al Jazeera. But it is to say that whether an issue even makes it to the Western media—makes it to the West's knowledge—is very much dependent on whether Islamist-leaning Al Jazeera wants to publicize it or not. More troubling, these events unequivocally betray the Egyptian military's Islamist inclinations. This should not be surprising: as a grassroots movement, the Muslim Brotherhood has long been infiltrating Egypt's culture so that some of the youth—who make up the bulk of the army—have naturally been indoctrinated in an Islamist worldview. 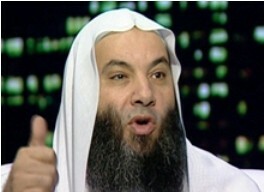 Indeed, the military, which keeps imprisoned some of the secular youth who initiated the original revolution, has just released a number of jihadists, including al-Zomar, who reasserted in his first interview the need for Egypt's Christians to pay the jizya tax, thereby confirming their inferior status under Muslim rule. Al-Zomar, of course, was not imprisoned because of his anti-Christian views, but because he was closely involved in the assassination of former President Sadat for making peace with Israel. Thus the Egyptian military's Islamist leanings suggest that changes for the worse are coming—not just for the Copts, but internationally as well. Because the Islamist worldview is interrelated, Egypt's leadership may well prove to be as anti-American and anti-Israel for the very same reason it is anti-Christian—all are infidels, all are the enemy. The only difference is that the Copts are weak, whereas America and Israel are currently not—thus unabashed animosity for the former, latent hostility for the latter.